First: July 26, 1986. Church Museum, Otto, Cattaraugus County. The seventeen officers and enlisted men who enrolled in Otto, seven of whom became casualties of war. Sponsored by the Cattaraugus Area Historical Society. Second: August 1, 1987. Church Museum, Otto, Cattaraugus County. The eight men who enlisted 125 years before, on August 1, 1862. Four of the eight became casualties. Third: August 20, 1988. 1887 Professional Building, Ellicottville, Cattaraugus County. 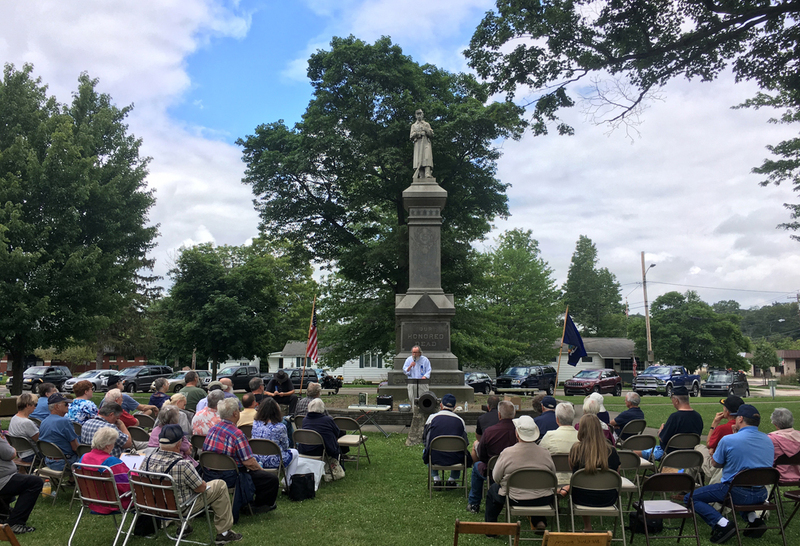 100th anniversary of the 154th New York's first annual reunion in Ellicottville, and reading of Captain Alfred W. Benson's moving oration on that occasion. Fourth: August 19, 1989. Franklinville Elementary School, Franklinville, Cattaraugus County. Reading of wartime letter written 125 years before by Surgeon Henry Van Aernam of Franklinville, and address by James A. Crosby of Kirkland, Illinois, on his ancestor Captain Alanson Crosby of Franklinville. Fifth: July 7, 1990. Portville United Methodist Church, Portville, Cattaraugus County. "Colonel Lewis D. Warner," and account of his life and service, and a reading of Warner's farewell address to the regiment by his great-grandson, John Lewis Spencer of Canandaigua, New York, 125 years after Warner delivered it to our ancestors at Elmira, New York, in June 1865. Held in conjunction with Colonel Warner Day, sponsored by the Portville Historical and Preservation Society. Sixth: August 10, 1991. United Methodist Church, Cattaraugus, Cattaraugus County. "Relics of the Regiment," a show-and-tell session. Sponsored by the Cattaraugus Area Historical Society. Seventh: August 15, 1992. Immanuel Lutheran Church, Olean, Cattaraugus County. "Faces of the 154th," a narrated slide presentation of the portraits of members of the regiment located and copied to date. Sponsored by the Olean Historical and Preservation Society. Eighth: August 21, 1993. American Legion Post 409, Gowanda, Cattaraugus County. "Our Musicians," featuring an account of the regiment's sixteen musicians, and performances by fifer Walter Sweet of Wellsville, New York, and drummer Silas Hudson Bunce of Salem, Massachusetts­great-grandson of Principal Musician Silas W. Bunce of the 154th­of the camp duty calls played during the war to regulate the daily lives of our ancestors. Sponsored by the Gowanda Area Historical Society. Ninth: August 6, 1994, pictured above. Allegany Community Center, Allegany, Cattaraugus County. "Color Bearers Lewis and George Bishop," brothers, heroes, and martyrs of the 154th. Lewis was mortally wounded carrying the national flag at Gettysburg; George was killed carrying the flag at Rocky Face Ridge. Sponsored by the Allegany Area Historical Association. Tenth: August 19, 1995. United Methodist Church, Little Valley, Cattaraugus County. "To Build a Chancellorsville Monument," initiating a fund drive that raised more than $5,000 from descendants and friends. The monument was erected at the edge of the field on which the 154th fought on May 2, 1863, next to the eastbound lanes of Route 3 about a mile west of the National Park Service's Chancellorsville Visitor Center. Fifty-five descendants and friends attended the monument's dedication ceremony on Memorial Day weekend in 1996. Eleventh: August 17, 1996. Fenton Historical Society, Jamestown, Chautauqua County. "Camp James M. Brown in Jamestown," the rendezvous of the 154th and 112th New York regiments. Sponsored by the Fenton Historical Society. Twelfth: August 9, 1997. Seneca Theater, Salamanca, Cattaraugus County. "Our Andersonville Prisoners," featuring selections from the Andersonville prison memoirs of Corporal Thomas R. Aldrich of Co. B, Corporal Newell Burch of Co. E, and Private Charles E. Whitney of Co. I, as read by Steven C. Bassett of Grand Rapids, Michigan (great-great-grandson of Corporal George Bassett of Co. D), William E. Goodman of Salamanca (great-grandnephew of Private Jefferson A. Goodman of Co. A), Karen Whipple Thomas of Hamden, Connecticut (great-great-granddaughter of First Sergeant Henry F. Whipple of Co. H), and Patricia Wilcox of Fairport, New York (great-granddaughter of Corporal Tom Aldrich). Thirteenth: August 29, 1998. 1891 Opera House, Fredonia, Chautauqua County. "Those They Left Behind Them," a dramatization of passages of the wartime letters of Private Samuel R. Williams of Co. F and his sweetheart Martha James, and Private William F. Chittenden of Co. D and his wife Mary Jane (Wheeler) Chittenden. The four were portrayed (respectively) by re-enactors Phil Palen, Nicki Gawley, Chris Thompson, and Debbie Bouquin. Fourteenth: July 10, 1999. Portville Presbyterian Church, Portville, Cattaraugus County. "Gettysburg's Unknown Soldier: Amos Humiston," featuring a dramatization of the "Great Union Meeting" held at the church on January 3, 1864, a key episode of the Humiston story. Sponsored by the Portville Historical and Preservation Society as part of its Heritage Days. Click here for a report on the reunion by David W. Onan II, great-great-grandson of Second Lieutenant Warren Onan of Company C.
Fifteenth: July 15, 2000. Randolph Presbyterian Church, Randolph, Cattaraugus County. "E. D. Northrup and His History of the Regiment," an account of Northrup's work and his ultimate failure to have it published. Sixteenth: July 14, 2001. First United Methodist Church, Westfield, Chautauqua County. "The Regiment and the President, Abraham Lincoln," focusing on Lincoln's review of the Eleventh Corps on April 10, 1863, the 154th's support of him in the 1864 election, and the men's sorrowful reaction to the assassination. Seventeenth: July 13, 2002. Norton-Chambers Post, American Legion, Hinsdale, Cattaraugus County. "The Gettysburg Monument and Mural," a look at commemoration of the 154th at Gettysburg by the regiment's monument and the Coster Avenue Mural (dedicated in 1988 and restored in 2001), featuring a re-enactment of the 1890 monument dedication ceremony and a slide show of the monument and mural through the years. The speech delivered by Colonel Dan B. Allen in 1890 was read by Mike Winey; the main oration given by James S. Whipple, son of First Sergeant Henry F. Whipple of Co. H (who was captured at Gettysburg and died at Andersonvile) was read by descendant Karen Whipple Thomas. A minitaure replica of the 154th's Gettysburg monument by noted Gettysburg sculptor Gary Casteel and a giclee fine art print of the Coster Avenue Mural were unveiled at the reunion. Both are offered for sale by Gary Casteel, with a portion of the proceeds to go to the monument's upkeep. For information about the monument replicas and mural prints at Gary Casteel's web site, click here. Pictured above are three generations of descendants of Pvt. 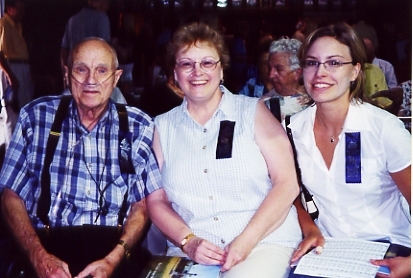 William Laing Jr. of Co. H. Left to right: great-grandson Richard Laing; his daughter Cheryl Laing Colvin; and her daughter Sarah Buehler. Rededication of the Coster Avenue Mural, Gettysburg: October 13, 2002. 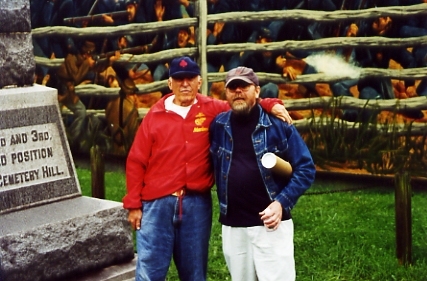 More than 125 people, including about 16 descendants of members of the 154th New York, attended the rededication of the mural and heard speeches by Mark Dunkelman and Edwin C. Bearss, Chief Historian Emeritus of the National Park Service and legendary Civil War historian and battlefield guide (pictured above). The Bearss Brigade -- friends and followers of Mr. Bearss -- were instrumental in funding the restoration of the mural, which took place in the fall of 2001. Eighteenth: July 19, 2003. Cassadaga Community Baptist Church, Cassadaga, Chautauqua County. "The Dead," examining how soldiers cared for dying comrades, saw that they received the best burial possible (or in rare cases sent their corpses home), and wrote the sad letters of notification and condolence to the deceased's loved ones. Out of 1,065 men who served in the 154th, 232 died in the service (22% of the total). 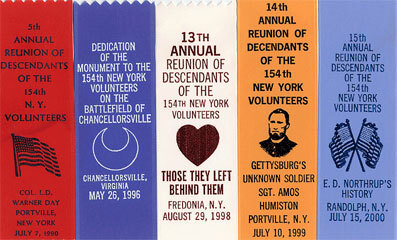 Attendees at the reunion received a list of the 232 dead, illustrated with portraits of 21 of them, in addition to the usual souvenir ribbon. Nineteenth: August 14, 2004. Leon Historical Society Church, Leon, Cattaraugus County. "Brothers One and All: Esprit de Corps in a Civil War Regiment," celebrating the new book of 154th New York history. 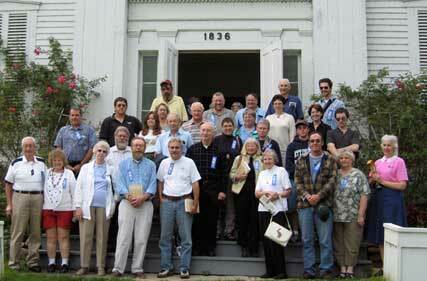 Pictured above are some of the descendants and friends who attended the reunion. The former Methodist Episcopal Church, built in 1836, is now preserved by the Leon Historical Society, which hosted the reunion. Seven members of Company K of the 154th enlisted at a war meeting in the church on September 6, 1862. A half-century later, in 1911, they reunited there during ceremonies to dedicate Leon's Civil War monument. Twentieth: July 16, 2005. Medora Ball Museum, Otto, Cattaraugus County. "Religion and the Chaplains." Congregational ministers Henry D. Lowing of Napoli and William W. Norton of Otto served the regiment as chaplains. The museum, cared for by the Cattaraugus Area Historical Society, is Norton's former Otto Congregational Church and was the site of our first two reunions in 1986 and 1987. Twenty-first: July 15, 2006. Allegany Community Center, Allegany, Cattaraugus County. “Stephen Welch, Charles W. McKay, and the Medal of Honor.” In the postwar years, Welch and McKay were awarded the Medal of Honor for rescuing a wounded comrade while under fire at the Battle of Dug Gap on Rocky Face Ridge, Georgia. They were the only two members of the regiment to be awarded the Medal. We commemorated Welch and McKay in their hometown. Among more than one hundred attendees were eleven descendants of Stephen Welch, pictured above. 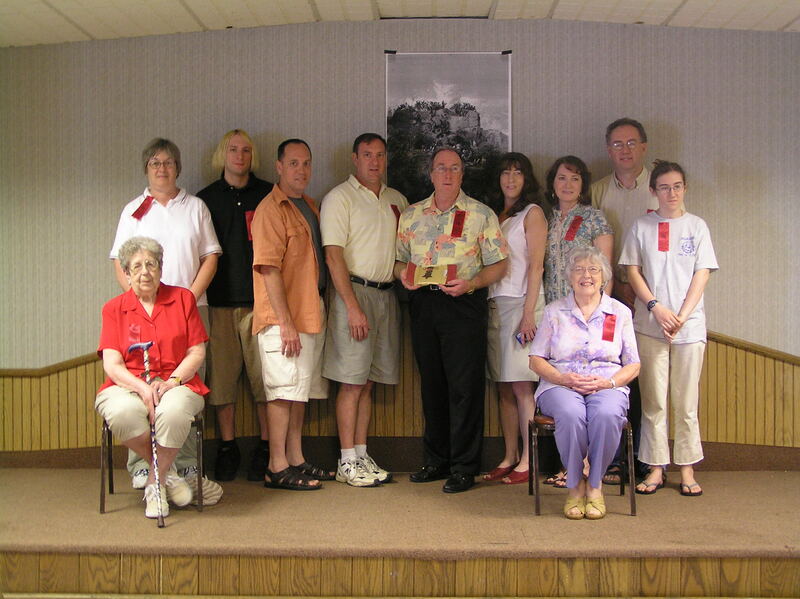 Left to right: Carolyn Stoltz (seated), Peg Stoltz, Kyle Welch, Tom Welch, Frederick Stephen Welch, Jim Welch (holding his ancestor's Medal of Honor), Mary Jean Davis, Celeste Taber, Celestine Welch (seated), Joe Stoltz, and Eliza Stoltz. Twenty-second: July 14, 2007. The Pavilion at Lakeside Park, Mayville, Chautauqua County. A joint reunion with descendants of the 112th New York. Presentations by Mark Dunkelman on the history of the 154th and by Joel Babcock on the service of the 112th. After the two regiments were organized simultaneously during the summer of 1862 at Camp Brown in Jamestown, they went on to differing careers in the army, only to meet again when their paths crossed in North Carolina in the spring of 1865, as the war was drawing to a close. Twenty-third: July 12, 2008. American Legion Post Hall, Ellicottville, Cattaraugus County. “Brigadier General Patrick Henry Jones,” a program honoring the 154th’s long-time colonel and most prominent officer in his adopted hometown. Twenty-fourth: August 22, 2009. VFW Hall, Franklinville, Cattaraugus County. “The Regimental Medical Staff,” commemorating the surgeons, assistant surgeons, hospital stewards, ambulance corpsmen, nurses and others who tended the 154th’s sick and wounded, in the hometown of Surgeon Henry Van Aernam. Twenty-fifth: August 14, 2010. Seneca Theater, Salamanca, Cattaraugus County. "The Battle of Dug Gap on Rocky Face Ridge, Georgia." First-hand accounts of the battle by members of the regiment, read in some cases by their descendants. Dug Gap was the 154th's third costliest battle in casualties, after Chancellorsville and Gettysburg. Twenty-sixth: July 16, 2011. Cattaraugus County Museum, Machias. "Adventures of a Civil War Historian." Unusual and sometimes magical stories from my fifty years of studying the 154th New York, illustrated with artifacts relating to each tale. Pictured above are some of the decendants of Cpl. John Langhans, Co. H, in attendance. Left to right: Douglas O. Frank, William A. Street, Gary C. Frank, Marilyn N. Hintz, Mary Ellen H. Chinchen, Floris D. Sarver, Ivan D. Frank. Twenty-seventh: June 30, 2012. Norton-Chambers Post, American Legion, Hinsdale, Cattaraugus County. A tribute to the late Mike Winey, a presentation on my new book, Marching with Sherman, and a raffle of quilts and other items made and donated by Merrie Ann Yosua of Bel Air, Maryland, great-great-granddaughter of Cpl. 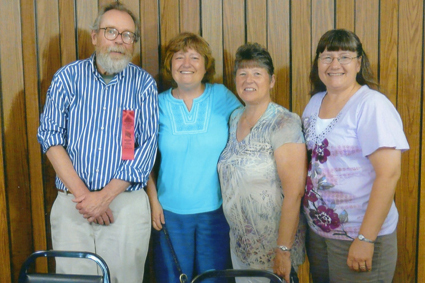 John Langhans of Co. H. Pictured above are (from left to right) Mark Dunkelman with sisters Joyce Rouba of Trenton, New Jersey; Gloria Sluyter of Bolivar, New York; and Karen Streif of Madison, Wisconsin, great-granddaughters of Cpl. Charles H. Field of Co. B.
Twenty-eighth: July 6, 2013. Chautauqua Institution, Chautauqua County. "Chancellorsville, Gettysburg, and Their Impact on the Hardtack Regiment." 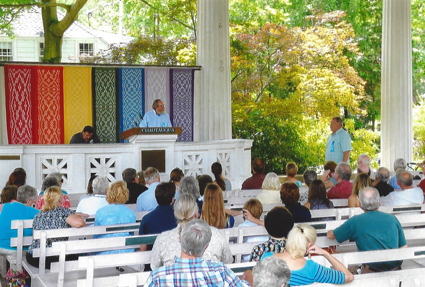 Visit the Chautauqua Institution website here. The circumstances that resulted in heavy casualties in the regiment's first two battles--40 percent lost at Chancellorsville, 77 percent lost in the brickyard fight at Gettysburg. The reunion was held at the Hall of Philosophy, pictured above. Twenty-ninth: August 2, 2014. American Legion Post 409, Gowanda, Cattaraugus County. “The Atlanta Campaign.” I presented background information on the campaign and my relative Scott Frank—great-great-grandson of Cpl. 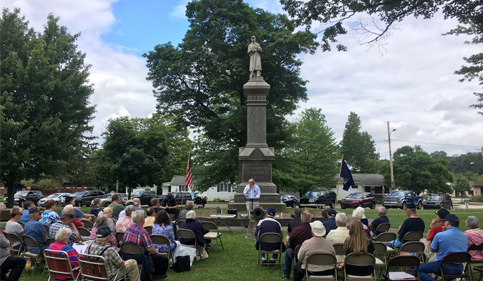 John Langhans, pictured above at the lectern—and friend Phil Palen—Village of Gowanda Historian—alternated in reading passages from the letters and diaries of members of the regiment describing the various engagements. They included Cpl. Job B. Dawley, Co. K, on the Battle of Dug Gap on Rocky Face Ridge; Cpl. Marcellus W. Darling, Co. K, on the Battle of Resaca; Pvt. Colby M. Bryant, Co. A, on the Battle of New Hope Church; Major Lewis D. Warner on the situation on June 1 near Dallas, the Battle of Pine Knob, and the situation on July 1, near Marietta; Pvt. William D. Harper, Co. F, on the Battle of Peach Tree Creek; First Sgt. Richard J. McCadden, Co. G, on the Siege of Atlanta; and Cpl. Milon J. Griswold, Co. F, on the Fall of Atlanta. As I mentioned in my remarks, by marching into fallen Atlanta, the 154th New York achieved perhaps its most significant victory of the war—one that helped to ensure the reelection of Abraham Lincoln in the presidential election of 1864. Thirtieth: August 1, 2015. St. Bonaventure University, Allegany, Cattaraugus County. “The Mark H. Dunkelman and Michael J. Winey Collection on the 154th New York.” The formal inauguration of the collection at the university, with a special exhibit of regimental artifacts in the Quick Center for the Arts. Thirty-first: July 30, 2016. Cattaraugus Firemen’s Club, Cattaraugus, Cattaraugus County. “The Ten Companies.” This reunion was unique. 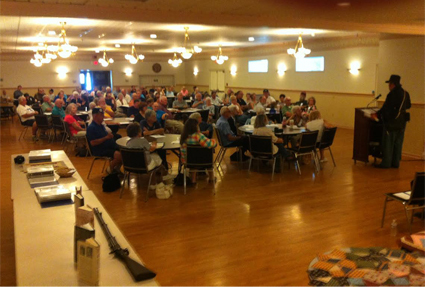 The approximately sixty attendees (pictured above) were grouped according to their ancestor’s company. Company H had the most representatives with fifteen; Company I went unrepresented. Some companies had single representatives. John Jewell of Guilderland, New York, represented his collateral ancestor Sgt. Charles C. Jewell of Co. C; Pam Garvey-Firth of Colonie, New York, represented her great-great-grandfather Pvt. Patrick Garvey of Co. F; Norm Burmaster of Bellefontaine, Ohio, represented his great-granduncle Capt. Matthew B. Cheney of Co. G; and Jean Rae Erskine of South Dayton, New York, represented her great-great-grandfather Sgt. 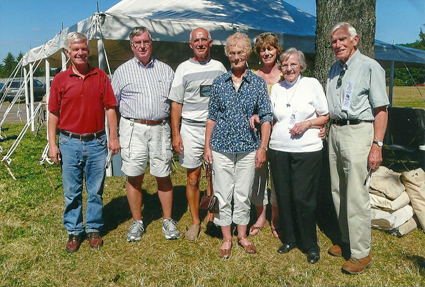 James M. Mathewson of Co. K. Dorothy DeSha of Franklinville and three grandchildren represented their ancestor Surgeon Henry Van Aernam and the Field and Staff. Descendants from Ohio, Iowa, North Carolina, Florida, and California were on hand. The different format was fun, but as usual the reunion was sobering. We were constantly reminded of the human cost of our ancestors’ service. Thirty-second: July 15, 2017. Fiddler’s Green Park, Springville, Erie County. “Our Ancestors as Veterans.” Sponsored by Springville’s Echoes Through Time Learning Center and Civil War Museum. The program explored how our ancestors commemorated their Civil War service in the organizations they joined, the monuments they erected, the reunions they held, their trips to old battlefields, the relics they preserved, and the memoirs that they wrote. Photo (above) courtesy of Rich Place, Salamanca Press. Thirty-third: August 25, 2018. Grounds of the Cattaraugus County Memorial and Historical Building, Little Valley. “C.A.M.P., Citizens Advocating Memorial Preservation.” C.A.M.P. sponsored and was the focus of this reunion. The program harked back to two momentous events in the regiment’s postwar history: the dedication ceremonies for the Gettysburg monument in July 1890 and the Memorial and Historical Building in September 1914. The main speaker on both occasions was James S. Whipple of Salamanca, a son of First Sgt. Henry F. Whipple of Co. H, who was captured at Gettysburg and died as a prisoner of war at Andersonville, Georgia. Karen Whipple Thomas of Boiling Springs, South Carolina, great-great-great-granddaughter of Sergeant Whipple, read selections from James Whipple’s two addresses. Renowned sculptor Gary Casteel of Gettysburg debuted his new miniature replica of the 154th New York’s Gettysburg monument, and is donating a portion of the profits from sales of the replicas to C.A.M.P. After C.A.M.P. President Tom Stetz described the group’s mission, General Ulysses S. Grant (Ed Brodbeck) introduced President Abraham Lincoln (Dave Kreutz), who recited the Gettysburg Address. 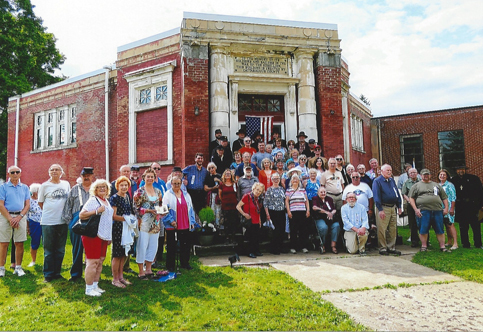 Following the traditional roll call, a portion of the approximately 125 attendees posed for the photograph above, taken by Annette Dunkelman. Thirty-fourth: July 20, 2019. Bemus Point United Methodist Church, Bemis Point, Chautauqua County. “The Captains.” A survey of the twenty-five men who were commissioned and mustered in at that rank and led the regiment’s ten companies. They ran the gamut from heroes to scamps, from beloved by their subordinates to disliked. Their stories offer a kaleidoscopic portrait of the regiment’s service. For information, e-mail me at nyvi154th@aol.com.